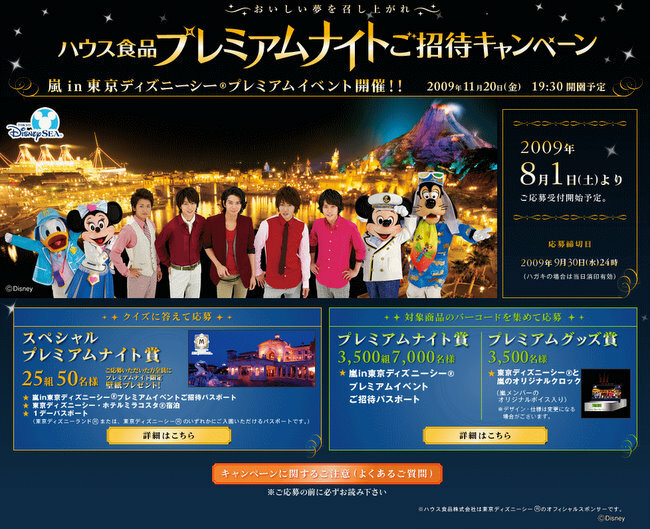 Arashi, the successful Japanese music group, will perform at Tokyo Disney Sea with Mickey Mouse on 20th November, 2009. The event called “Premium Night” will be held as part of the House Foods (ハウス食品) campaign which will see 3,525 couples chosen to participate in this invitation only private concert. There will also be a chance for 25 couples to win a stay at the Mira Costa Disney Hotel. Entries are due in by September 30, 2009 by postcard or on the campaign site. Currently celebrating their 10 year anniversary as a band, they have a series of concerts planned for the year including a performance at the National Stadium on 28th August, 2009. RT @Shibuya246: Arashi Disney Concert | Japan | Shibuya246 http://bt.io/2UM Some how things are always connected w/ Disney. But good for them. I actually reconize on of the band members of this group. Matsumoto Jun who played Shin Sawada in the j-drama Gokusen the third season and their music was used also. So I thought their music sounded familar. Did you ever watch that j-drama. One other thing, intense debate is not posying my comment score, could you check on that for me? Thanks. thanks. glad you could pick up the band members and find them in the drama. Thanks for posting this shibuya! I am going to tell my Arashi network. Somebody warp me there already!